The Department of Geography, Trinity College Dublin, is seeking a geographer with solid urban background to undertake a project on the significance of activist occupations in understanding the role that urban vacant space plays in the capitalist city. The PhD will be supervised by Dr. Cian O’Callaghan. NOTE: The deadline for receipt of 1st phase applicants is March 22 2019. 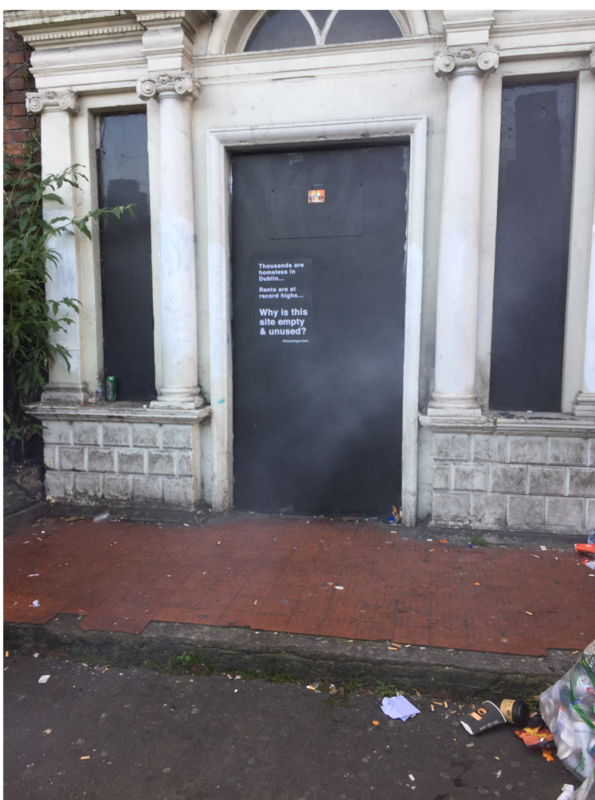 Activist occupations of vacant properties in Dublin and other cities have highlighted the contradiction of buildings lying empty at a time of spiralling homelessness and problems of housing affordability. Such practices are indicative of the growing visibility and politicisation of urban vacancy following the global financial crisis. Urban vacant space has emerged as an important site in these transformations, being at once a site of politicisation, civic possibility, policy intervention, and market reengineering. In Ireland, policy solutions to more effectively measure and tackle vacancy have been rolled out at national and local levels. Yet, despite academic and policy attention, urban vacancy remains an under-researched and often misunderstood topic. use the conceptual lens of occupations to analyse theoretical gaps regarding vacancy. The project will develop case studies in two-to-three cities: Dublin, Ireland, another European city (Barcelona, Spain, Rome/Naples, Italy, or Lisbon, Portugal), and potentially Sydney, Australia, and employ mixed-methods incorporating policy and discourse analysis, stakeholder interviews, and ethnography. The final selection of case studies and methods used will depend on the expertise of the PhD candidate. This new TCD Ph.D scholarship is intended to provide up to 24 hours/month in research support to the TCD Professor. You are applying for a highly competitive 4 year fully funded scholarship. You must have no barriers to international travel. Send preliminary applications to: Dr Cian O’Callaghan (ocallac8@tcd.ie. Please place ‘Provost PhD application’ in the subject line of the email. A cover letter: Your letter should clearly set out your suitability and motivation for this PhD with reference to your past relevant experience and achievements. PhD start date can be either 1 September 2019 or 1 March 2020. Please state your preferred start date in your cover letter. A CV that includes your relevant experience, undergraduate results and postgraduate results (if applicable), and contact information for 2 academic referees. Successful Phase 1 candidates will proceed to Interview. The successful candidate will then be invited to submit a full application to Trinity College Dublin. Poor Shane Ross. Offered the chance by Richard Boyd-Barrett to begin moving Ireland’s transport policy into the 21st century, he blew it with a short-sighted, idiotic answer to a parliamentary question. Boyd-Barrett asked if Ross would undertake a cost-benefit analysis of free public transport. Did Ross think long and hard about it? Apparently not. His answer was ‘no’ and for evidence he rolled out the notion that it’d cost the exchequer an extra €600m. Game over? It shouldn’t be. (1) Free public transport is a matter of inclusion, well-being, and happiness. It works for those using the Free Travel Scheme. It permits movement; grants access to the city, the country, to friends and family. Extended to everyone, free public transport would give a massive happiness boost to everyone who wants to get out and about. Inclusion and well-being should be the main argument for free public transport. It’s about ‘the right to the city’ (and the country). (2) Free public transport – albeit with extra investment (in electric buses; trains fuelled by hydrogen; [gasp!] an underground metro) to deal with rising passenger numbers – would further reduce carbon emissions. We need climate action and Shane Ross, as Minister for Transport, Tourism and Sport, should be taking the lead, not obstructing things with daft arguments. He needs to get a grip and realise what we’re dealing with. The sooner we get people out of cars, onto bikes, onto buses and trains, the better. Let’s go. (3) Free public transport makes the overall transport system more efficient and kinder. It could reduce the dwell time while buses wait for passengers to alight: no more hanging about as everyone taps their Leap card or pays the driver. Buses and trains could eradicate spending on the hardware and software used to collect fares. No more barriers. No more lines of tired people at the Dart station while they wait to tap off. And no more fines on the Luas for the unaware tourist who didn’t realise they needed to tag on. In short, the system would be more efficient and less authoritarian. Staff on the Luas or Irish Rail could spend more of their time helping people. What are we waiting for? (4) Free public transport can make Ireland’s cities better places to live, or at least work. Congestion costs a fortune and is exhausting. It also stinks, pollutes the air, and causes asthma. For the thousands of workers who can’t afford to live in urban areas, moreover, free public transport to their job in the city puts more money in their pocket to be spent on what they care about (kids, eating out, holidays, whatever). (5) Finally, Ireland’s tourists spent €4.9bn in 2017. 13% was spent on transport. That’s €637m, although of course some of this covers taxis. Free public transport permits tourists to spend (OK, some of) that money in restaurants or visitor attractions. Jobs. Happier tourists. A more balanced tourism market across the country. And if we made free public transport a cornerstone of Fáilte Ireland’s marketing campaign, surely more tourists would be tempted to visit. If nothing else, the country sends a message: come and move around; you’re welcome. Here is (at least a big chunk of) the €600m that blind-sided Shane Ross. Can we just get on with making this country better now? It is a necessary and a timely moment to take stock and reflect on the transformation of Dublin’s built environment.This is not something we do very often. Indeed, with the exception of the period following the 2008 crash, Dublin has been redeveloping faster than we can critically reflect on these changes. One of the themes we are asked to reflect on here is the juxtaposition of new development with persistent areas of vacant and unused buildings and land. As I will discuss, vacancy became visible and politicised in the period after the crash. A range of different actors have proposed interventions and solutions, which reflect different development priorities. However, over the last number of years, levels of development have once again accelerated – large areas of undeveloped land have been intensively redeveloped. But in doing so, a lot of the possibilities for rethinking what makes Dublin a liveable city have been diminished. And we are once again in danger of reducing the city centre to a commercial space. I want to briefly discuss here is how looking at debates about vacancy and what has happened to vacant sites in Dublin over the past ten years can tell us about how development priorities have been shifted over this period. Firstly, to discuss some of the reasons why urban vacancy became visible and a priority for different sets of groups after the crash, but visions for solving this problem presented very different urban futures. Secondly, to argue that we need to move away from simplified views that see a dichotomy between urban space that is in use (or being redeveloped) and space that it “unused”. Rather we need to consider the ways in which vacancy is part of urban property markets and move towards understanding the reasons why buildings and land remains vacant and how it transitions to what is seen as “appropriate” use. Finally, to suggest that the set of actors involved in planning and development and their priorities have dramatically shifted since the crash. And that urban policy may no longer be able to deliver on its objectives in the same way, and therefore requires some rethinking. Vacancy was a major part of the narrative about Ireland’s crisis. The ‘ghost estate’ was perhaps the most iconic image representing the crash of the Celtic Tiger property bubble. But the discussion soon extended to the vast tracts of vacant land in Dublin city centre. This included the very visible ruin of the Anglo Building in Dublin’s north docks. Anglo’s role in the banking and property crash is well known and many identified the symbolic potential of this prominent ruin as a site to memorialise the collective failures that led to the Celtic Tiger’s crash. With hindsight, it is easy to forget how much of a shock the crash of the Celtic Tiger was in 2008. This was not only economic but also deeply social and psychological collapse of meaning. As a symbol of the property crash, unfinished and vacant developments became a site from which the public could reflect on the policy failures of the development system, while also presenting an opportunity to rethink how we might do things better in the future. Proposals for the Anglo building included those by architect Paschal Mahony to create a vertical park out of the shell of the building – intended to reclaim a symbol of speculation and greed as a public civic space. This didn’t happen. The Anglo ruins were ultimately built upon and became the new home of the Irish Central Bank. This example is indicative of the trajectory of vacant spaces and development priorities over the past decade – the possibilities to use sites of vacancy to produce new public spaces, cultural and social activities, and plan for housing affordability gave way to the reassertion and deepening of highly commercial development objectives. The Dublin City Council Development Plan suggests that vacancy is both a “challenge and an opportunity” for the city. This reflects, on the one hand, the problems of vacancy identified by planners, while on the other hand, it responds to a set of bottom up responses that emerged following the crash. 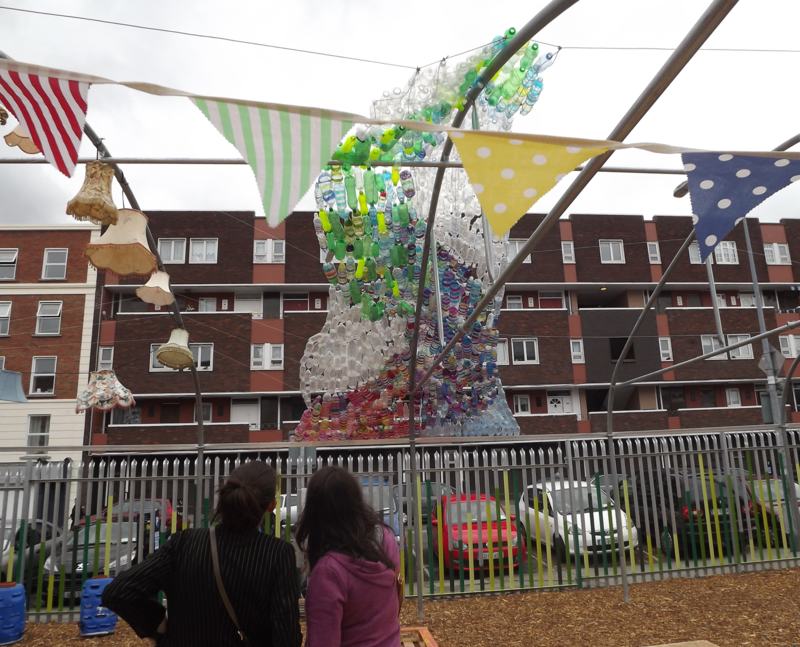 These were diverse in nature – including the use of vacant land for urban agriculture and community gardens, empty buildings given over to cultural uses for cheap rents, and more explicit temporary use projects such as pop-up parks. But what they had in common was a desire to use the resource of vacant spaces for activities ordinarily not possible within a highly commercial city. Moreover, these projects often sought to lead by example and show how alternative forms of urban living were possible. Policy makers responded in turn to these bottom-up activities by promoting the vibrancy of temporary use activities and creating soft policy measures to encourage such projects. It was proposed that re-using vacant spaces would add to the cultural and social life of the city in the absence of wider development. At the same time, DCC pioneered the vacant land levy as a way to combat land hoarding and kick-start redevelopment. From this perspective, alternative projects to re-use vacant spaces were seen as a mechanism to reignite the entrepreneurial approach to urban development. The assumptions of this policy approach are that, through a combination of good planning and urban design, the local authority can work with the private sector to redevelop the city in ways that promote economic growth at the same time as creating vibrant places. However, at the same time as this was happening the financial policies responding to the crisis – in particular the setting up of NAMA – brought in a whole new set of development actors to Dublin. As bottom up responses were piecemeal creating alternative visions of the future of Dublin, and DCC were aiming to incorporate these initiatives into their policy approach, these new actors were laying the ground to dramatically transform the city at an unprecedented speed. These financial actors also had a vision for vacant space, albeit very different from the others. When the loans from the major Irish banks were transferred to NAMA, the agency ended up controlling significant amounts of empty buildings and vacant development land. In the docklands SDZ, for example, NAMA controlled around 85% of development land. This vacant land was synonymous with “distressed debt” and was transferred from NAMA at a heavily discounted price to international private equity funds, Real Estate Investment Trusts and other financial actors. Vacancy for these actors represented an opportunity to resolve the property crash by connecting local real estate to international finance. As has become apparent from the character of new developments in the last number of years, these financial models are dependent on maximising rental yields. Consequently, more marginal cultural uses, often those adding vibrancy to areas in the interim period, have been squeezed out. NAMA, through its receivers, for example have been instrumental in removing such cultural spaces as the skatepark Mabos in Grand Canal Dock and The Complex Theater in Smithfield – both projects promoted by DCC for the cultural vibrancy they added to their respective areas. In this way, as the property market returned the possibilities of vacant spaces have diminished as increasingly commercial demands are put on space. But what this also shows, is vacant space presented very different challenges and opportunities for the different sets of groups. The contestation over the future of these sites was indicative of what kind of city Dublin would become. Discussions about the “problem of vacancy” often tend to frame the issue in simplified ways. “Vacant” buildings and land is juxtaposed to land that is “in use”, giving the impression that these buildings and land are simply abandoned by their owners. As vacancy has become more visible, responding to the problem has become central to policy at the local and national level. But these policy interventions have suggested that we do not understand vacancy and the reasons for it very well. The discussion from a policy perspective is often around overcoming barriers to bringing vacant spaces back into use. However, urban geographers – particularly those researching gentrification – have long shown how vacancy is an integral part of functioning urban and markets. Vacant buildings and land are used as part of investment strategies that can have shorter or longer time horizons. In this regard, it is not simply about what is “in use” or “not in use” – rather the underlying development pressures on urban land markets may heavily determine what are “appropriate” types of use. Firstly, it fails to acknowledge the kinds of social uses that under-developed land and buildings might already be fulfilling, and it fails to ask questions about what kinds of social uses these spaces will provide following regeneration. Secondly, it fails to account for the ways in which vacant land and buildings are already in use in an economic sense – that vacancy can be an investment strategy. It therefore fails to grapple with the real causes of vacancy and its relationship to the types of urban transformation taking place. Addressing these questions may offer a more nuanced way of considering what our development priorities should be. The need for such an approach is clearly illustrated by the trajectory of post-crisis developments in the city. Dublin’s economic recovery has been highly unequal. The city is facing a range of problems. Two of these are in relation to housing and cultural spaces in the city. Rents in Dublin have risen by 65% since a low point in 2010. Combined with a lack of new supply and an intensification of the commodification of housing, this has resulted in a homelessness emergency driven by evictions from the private rental sector. Figures from Nov 2018 had 1296 homeless families (with 2816 children) in emergency accommodation in Dublin. Neither does this include the many more people living in insecure housing conditions due to the volatility of the housing market and the lack of public sector intervention. Meanwhile, there is growing concern among the cultural sector about a serious dearth of arts infrastructure in the city. Spaces of cultural production, which could support and nurture new graduates as well as established artists, flourished following the property crash. But these spaces have been progressively squeezed out. And it is becoming increasingly difficult to see where these spaces can be fit into new types of redevelopment. Without more formal and sustained interventions, the city will become a desert incapable of supporting cultural and artistic life. Both of these problems can be seen as the outcomes of opportunities lost in the response to the crisis. The crisis presented a fundamental challenge, but it also offered an opportunity to reflect on and rethink our approach to development. Given the role of property and housing in particular in the Celtic Tiger bubble, there was an opportunity to learn from those mistakes and rethink our approach to development. Despite clear failures of a market-driven approach to housing delivery, we have continued down this path. Moreover, NAMA as the biggest landowner in Europe at one point, was an opportunity for the state to create a strategic land bank, which could be used to deliver housing and other key infrastructures. Likewise, the bottom-up potential demonstrated by the cultural spaces that flourished after the crash both showed the extent to these activities had been excluded during the property boom and the vibrancy that they could add to places and communities. But despite the recognition of this by policy makers, there were very few measures put in place to enable these activities to be sustained beyond an interim period. These problems can be understood with regard to two interrelated factors. Firstly, the set of development actors in Dublin has shifted substantially following the crisis. NAMA became a major new player in property markets, reducing the role of the local authority. And through the sale of their portfolio, the agency has overseen a huge transfer of development land to a new set of international financial actors. This has both concentrated land ownership and changed the way developments are financed and how they are expected to perform. The model of these international financial actors is to ensure a growing rental stream to satisfy shareholders and investors. This puts increasing commercial pressure on the use of urban space. And it makes it more difficult to include uses like affordable housing or cultural space – neither of which generate the desired profits. Secondly, what these problems show is the failure of existing policy approaches to adapt to these changing conditions. The basic assumptions of the entrepreneurial model that has guided urban development since the 1980s is that by combining good planning and design with private sector partnerships, we can create vibrant new urban landscapes. But there is increasing gaps between policy objectives and the types of development that is occurring. Dublin City Council’s development plan, for example, puts great emphasis on cultural activities. But an area like Smithfield (which had been identified as a cultural hub) has lost much of its cultural vitality in the most recent phase of redevelopment. Artist groups, worried about the scale and speed of redevelopment, have been lobbying for state agencies to intervene to ring-fence land and buildings for arts infrastructure. The SDZ for the docklands was presented as an opportunity for “joined up planning” and aimed to be “a model of sustainable inner city regeneration incorporating socially inclusive urban neighbourhoods”. This included an emphasis on making it a neighbourhood for families to live. However, as was reported in the Irish Times last week just 26 social homes have been provided “out of 1,178 apartments granted permission to date”. And the oversight body expressed serious concerns that there would be a drastic shortfall on the statutory minimum of 10% required. 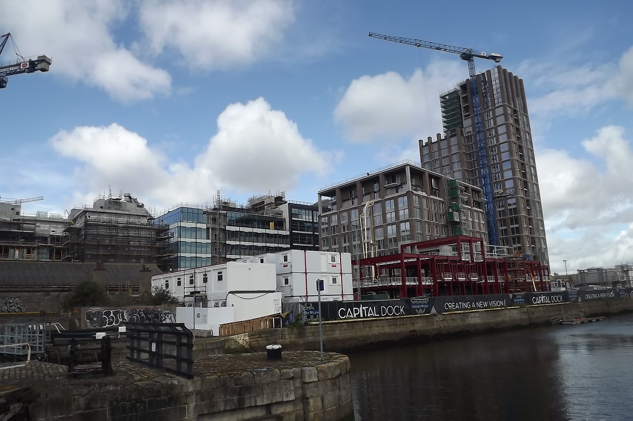 In the Dublin of 2019, development is once again happening at a rapid speed. We rarely reflect on the scale of transformation and what can be lost in the process. But we need to do better at this. The lessons that we can learn from the debates about vacancy following the crash and the trajectory of the city’s vacant spaces can help us see the causes of current problems and intervene to mitigate those that are coming down the line. The gap between policy objectives and development realities shows the need for more serious and targeted forms of intervention. There is a clear argument for public land being ring-fenced for public uses in the context of current development pressures – for housing, for culture and other common goods. Left to the market these common goods will disappear and we will be left with a lucrative but unlivable city. But there are opportunities to at least stem the tide of such changes. We can really learn from the mistakes of the Celtic Tiger period and reassert the role of the public city.